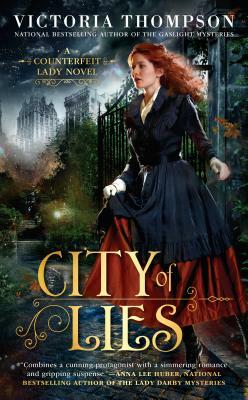 From the national bestselling author of the Gaslight Mysteries comes the first Counterfeit Lady novel--the intriguing start of a historical mystery series featuring woman-on-the-run Elizabeth Miles. Like most women, Elizabeth Miles assumes many roles; unlike most, hers have made her a woman on the run. Living on the edge of society, Elizabeth uses her guile to relieve so-called respectable men of their ill-gotten gains. But brutal and greedy entrepreneur Oscar Thornton is out for blood. He's lost a great deal of money and is not going to forgive a woman for outwitting him. With his thugs hot on her trail, Elizabeth seizes the moment to blend in with a group of women who have an agenda of their own. She never expects to like or understand these privileged women, but she soon comes to respect their intentions, forming an unlikely bond with the wealthy matriarch of the group whose son Gideon is the rarest of species--an honest man in a dishonest world. She knows she's playing a risky game, and her deception could be revealed at any moment, possibly even by sharp-eyed Gideon. Nor has she been forgotten by Thornton, who's biding his time within this gilded orbit, waiting to strike. Elizabeth must draw on her wits and every last ounce of courage she possesses to keep her new life from being cut short by this vicious shadow from her past. Victoria Thompson is the Edgar® and Agatha award-nominated author of the Gaslight Mysteries--including Murder in the Bowery, Murder in Morningside Heights, Murder on St. Nicholas Avenue, Murder on Amsterdam Avenue, and Murder in Murray Hill--as well as numerous historical novels.